Reading and share top 2 famous quotes and sayings about Lotus And Mud by famous authors and people. Browse top 2 famous quotes and sayings about Lotus And Mud by most favorite authors. 1. "The symbol of the Lotus flower gives a precious teaching that can inspire us to deal with life in the best possible way. 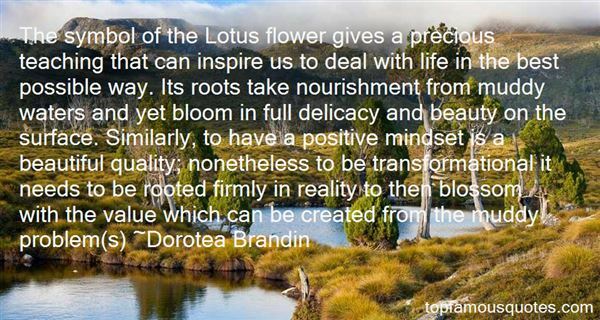 Its roots take nourishment from muddy waters and yet bloom in full delicacy and beauty on the surface. Similarly, to have a positive mindset is a beautiful quality; nonetheless to be transformational it needs to be rooted firmly in reality to then blossom with the value which can be created from the muddy problem(s)"
2. "The lotus is the most beautiful flower, whose petals open one by one. But it will only grow in the mud. In order to grow and gain wisdom, first you must have the mud --- the obstacles of life and its suffering. ... 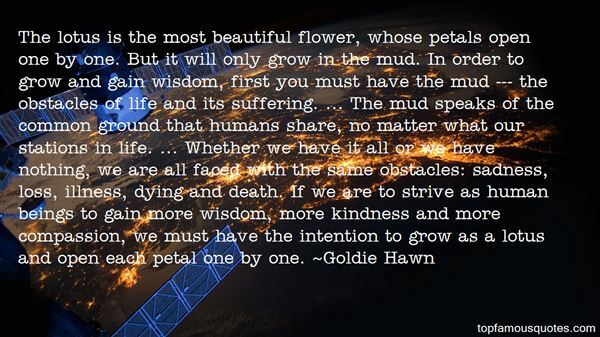 The mud speaks of the common ground that humans share, no matter what our stations in life. ... Whether we have it all or we have nothing, we are all faced with the same obstacles: sadness, loss, illness, dying and death. If we are to strive as human beings to gain more wisdom, more kindness and more compassion, we must have the intention to grow as a lotus and open each petal one by one." Whistler,' Manet called. 'How's your mother?"